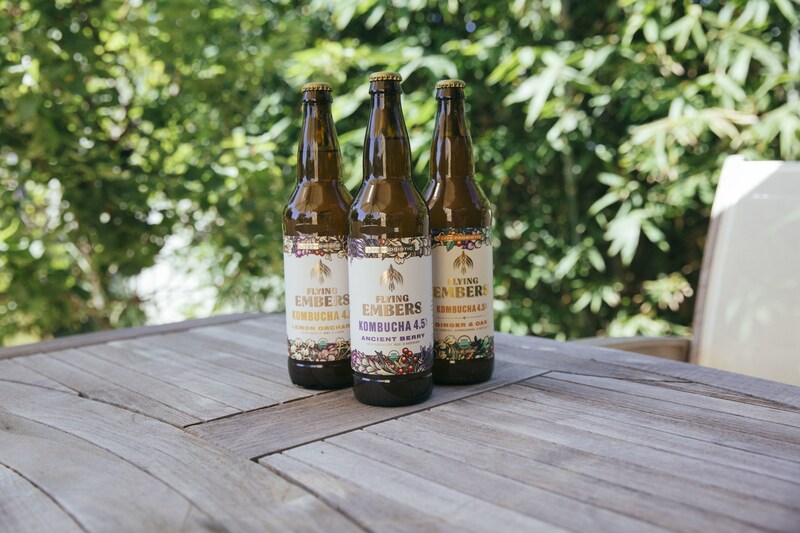 20 Dec 2018 --- US beverage brand Flying Embers is partnering with beer distributor Reyes Beverage Group to launch a fermented alcoholic beverage line fortified with adaptogenic ingredients. The drink is fermented with a base of ginger, turmeric, astragalus and the increasingly popular adaptogen ashwagandha. At 4.5 percent alcohol by volume, the Organic Hard Kombucha is made from a sparkling fermented tea kombucha culture. The beverages are touted as containing live probiotic cultures, botanical adaptogens and functional wellness benefits. Available in a variety of flavors including Lemon Orchard, Ancient Berry and Ginger & Oak, the beverages are organic, vegan and gluten-free. Adaptogenic herbs are used in traditional herbal medicine for their claimed ability to stabilize physiological processes and promotion of homeostasis. Popular adaptogenics include holy basil, maca, ashwagandha, rhodiola and ginseng. “Flying Embers is the culmination of my knowledge of twenty plus years of fermentation and creating better-for-you beverages,” says Flying Embers Founder Bill Moses. The line of fermented drinks is available statewide in Southern California, in the form of consumer-friendly kegs as well as in bottles and cans. Fitting in with the growing interest in fermented foods, which are widely seen as good for digestive health, kombucha drinks have been gaining traction for some time now. According to Innova Market Insights, over eight percent of global iced tea launches in the 12 months to the end of June 2017 featured kombucha in a rising range of flavors and formats, up from just over five percent in the 12 months to the end of June 2016 and less than one percent five years previously. Numbers rose nearly 60 percent in the 12 months to the end of June 2017. Penetration is even higher in specific regions, such as North America, where it reaches over 21 percent and in Australia/NZ, at nearly 30 percent, albeit from a small base, Innova Market Insight reports. The UK has also seen strong levels of activity. It is not a traditional market for iced tea, with the majority of consumers still preferring to drink their tea hot, but kombucha has nonetheless managed to gain a foothold, accounting for nearly one-third of iced tea launches, although penetration in Europe as a whole is less than seven percent. Further proving the beverage’s popularity, in September, the Coca-Cola Company acquired kombucha maker Organic & Raw Trading Co., which makes the MOJO brand of naturally fermented, live culture, organic kombucha drinks.